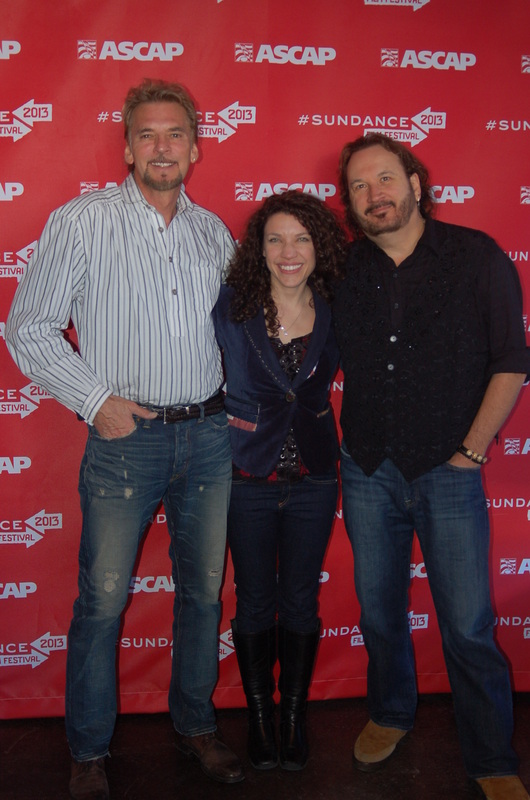 Blue Sky Riders are, from left, Kenny Loggins, Georgia Middleman and Gary Burr. 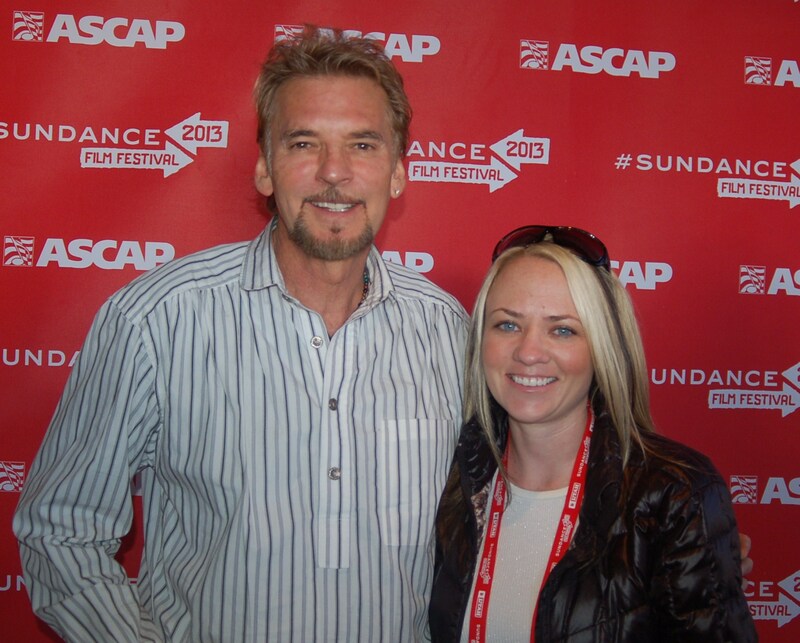 Kenny Loggins with ON AND BEYOND’s Chalese Dalton at the ASCAP Music Cafe at Sundance. One of the hottest performances at this year’s Sundance Film Festival wasn’t on a screen–it was on the stage of the ASCAP Music Café on Park City’s Main Street. That’s where on January 18, audiences got a taste of Blue Sky Riders, just days before they performed on January 24 on “The Tonight Show” with Jay Leno. Though the group itself might yet be unfamiliar to music lovers, its members are legends in the industry. Singer/songwriters Kenny Loggins, Georgia Middleman and Gary Burr are a veritable who’ s who of music royalty. Loggins began his rise to stardom with musical partner Jim Messina in the early ‘70s, then broke out as a solo artist and has been making hit records for decades. 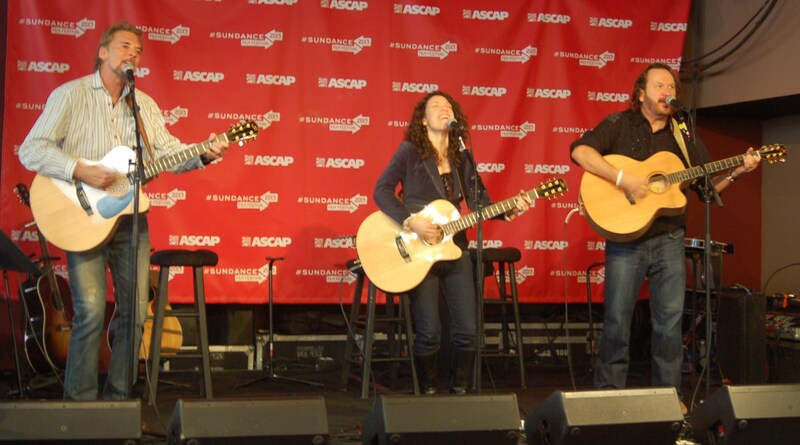 Both Middleman and Burr are legendary songwriters in Nashville, as well as popular performers. Among the artists they’ve penned songs for are Keith Urban, Faith Hill, Kenny Chesney, Reba McEntire, Conway Twitty and Wynona Judd. Their convergence as Blue Sky Riders was a long-time coming, but, in Loggins’ mind, inspired. Georgia and Gary were performing together in Montgomery, Alabama when he first approached her with the idea. They were also dating at the time (and are now married). “I said, ‘Remember that crazy idea Kenny Loggins had about a band? He just sent me an email and said we need a girl. Do you have any ideas?’” Gary said, prompting Georgia to smile and give him a playful slug on the shoulder. “I was quick to assure Kenny that Georgia was not a fan of his,” Gary jokes. In fact, the ease and camaraderie these three performers feel around each other is clearly evident throughout both our interview and their onstage performance hours later. They greatly respect and like each other. Blue Sky Riders came together over a two-plus year timeframe. With Gary and Georgia living and working in Nashville, and Kenny living in Santa Barbara and performing more than 80 times last year, the pieces came together slowly—but steadily. “I’m a bit surprised that it took so long, too,” Gary said. “But it felt really healthy and natural, and it was always on our minds.” Now, their full-length debut, “Finally Home,” is set for a nationwide release on January 29. BSR is also performing in Nashville at the Grand Ole Opry on February 1. For Kenny Loggins, who has been a solo artist since Loggins and Messina broke up nearly 30 years ago, the idea of becoming part of a group again might seem surprising to some. But not to him. Blue Sky Riders will be performing this coming summer at the South by Southwest Festival in Austin in March, and the Stagecoach Music Festival in Indio, California on April 28. Catch their music and news on their website: blueskyridersband.com. Like their name—these Blue Sky Riders are clearly going to ascend to great heights. Listen and you’ll know why. In 1999, a Japanese doctor named Masaru Emoto began publishing a series of volumes titled “Messages from Water.” His hypothesis is that human consciousness has an effect on the molecular structure of water; that positive changes to water crystals can be achieved through prayer, music, or by attaching written words to a container of water. He has sold over two million books as well as other products related to his theory, and also sparked plenty of controversy in the scientific and medical communities. For any parent, particularly one who blames himself for his daughter’s death when he couldn’t save her from drowning, hope of any kind springs eternal. That’s the premise behind a brilliant new independent film called “Imagine,” written, produced and directed by Jahanara Saleh and Jonathan Steven Green (Austin James Green was also co-writer and director of photography). Actor Scott Wolf plays a paramedic named John Morris, who feels numb and helpless in trying to overcome his guilt, and hoping to save his crumbling relationship with his wife Kate, played by actress Melissa Deppe Fischer. In an attempt to gain control of his life and his understanding of the universe, Morris experiments with digesting water that has been “charged” or influenced by specific thoughts, energy, emotions or concepts. As he does, he feels changes in the world around him. He hopes that continuously ingesting the water may even help him change history, and bring his daughter back to life. The directors, who filmed the movie in just 12 days, started putting the project together in 2010, while Jahanara was finishing her work on a degree from the University of Utah. Though her career plan centers on teaching, filmmaking for both her and the Green brothers has also become a passion. Both Wolf and Fischer, neither of whom were familiar with Emoto’s work beforehand, were caught up instantly in the screenplay. Wolf, who was living in Utah at the time when the film was shot there (in June 2011), was equally impressed from the beginning with the screenplay. Both lead actors are also parents—Wolf and his wife Kelley just had their second child in November and Fischer and her husband have two children—making the script even more powerful. The producers just finished the final editing, and are now submitting the film to festivals around the country. Its initial screenings should start this spring. You can learn more about “Imagine” on the film’s website at http://www.imaginetheshortfilm.com. The producers also have a Facebook page for the film.